This past week, a few scientists took the bench and gave the U.S. Congress a relative date by which they expect we’ll have discovered signs of intelligent life elsewhere in the universe. According to their estimates, by 2034 we should make first contact or 30 years ahead of Star Trek’s first contact. Whether this was just a stunt, a ploy meant to convince Congress to up SETI’s budget, or a genuine estimate is difficult to tell. Depending on the financing, indeed. Shostak is a Senior Astronomer at the SETI Institute, an agency tasked with finding out about the existence of intelligent life anywhere in the universe by discovering radio signals which have artificial origin from outer space. The project was first launched in 1984 with great enthusiasm, following popular interest for extraterrestrial entities after movies like E.T. and Alien swept the globe. Today, SETI has a budget of only $1 million and was nearly shut down and would have been were it not for the support of thousands who donated to keep SETI alive. With this in mind, I have to admit I was astonished to read Shostak’s statement, but how far off is he really? 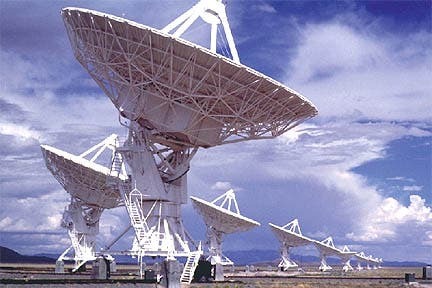 What Shostak and his colleagues at SETI are actually trying to point out is that given our current rate of technological advancement, it will only be a matter of time until we manage to pick up extraterrestrial signals. The next generation of supercomputers and telescopes will definitely aid in attaining this objective, and recent discoveries by the now famous Kepler telescope have been more than encouraging. Thanks to Kepler we now have a much better and broader understanding of the Universe. We know for instance that there are innumerable Earth-like planets that orbit stars in a habitable zone. SETI certainly is currently equipped for the job, with its deployment of Arecibo’s 305-meter telescope, the largest in the world, and throughout the entire year Arecibo’s 305-meter telescope scans the cosmos for signals from alien civilization. With only 1$ million funding a year, however, one can only wonder how the staff manages to survive, let alone have time and energy to search for aliens. Shostak hopes that by investing in SETI now, we will be able to take advantage of our dramatically increased computing power to tune into a very distant talk show or whatever it is that aliens might have broadcast at one point. “It’s unproven whether there is any life beyond Earth…I think that situation is going to change within everyone’s lifetime in this room,” Shostak said.